We all have our Favorite Antique Jewelry! Invest in Moonstone antique Jewelry if Moonstone gems, that have stood the test of time and roar quality, are high on your list of favorite gemstones! With Moonstone Gemstone Jewelry, you've found a great place to start a fabulous Jewelry collection that roars! This type of Antique Jewelry is relatively (I say this cautiously, as high quality moonstone is rare and quite valuable) more affordable. You will not be disappointed! Your pleasure and buying confidence will grow with an appreciation of these incomparable, light and delicate opalescent gems with their cool internal glow. An Appreciation of the Value of Antique Jewelry develops from an understanding of How to Invest Money, not in fiat money and stock markets, but in rare and beautiful Antique Gemstone jewelry. Antique jewelry you can wear today, that didn't cost the earth. Amber gemstone jewelry, like Antique Moonstone Jewelry, is another unusual gemstone, popular in the late Victorian period. No other type of jewelry on earth, can compare to unusual gemstone jewelry, that came into fashion in the 1880s in the late Victorian era (1885-1901). Looking For A List of Gemstones? Click HERE! Semi-precious stones set into jewelry though, have been used for hundreds and thousands of years, long before young Victoria was crowned Queen of England. Moss agate and moonstone jewelry were favorites of Madame de Pompadour and royalty in the middle of the 18th century. In her famous collection of forty rings, several were set with moss agate and Moonstones, surrounded with diamonds. Others pieces, were set with malachite and carbuncle (an unfaceted garnet). The popularity of Moonstone jewellery continued to be a popular choice in gemstone Jewelry of the 20th century and into the New Millenium. Ms Sybil Dunlop was notable for her Famous Collection of jewelry, with its subtle combinations of colorful stones, set in silver in the Art Deco Jewelry Style of the 1920s: one of the great collectors, partial to unusual gemstones, she loved to invest in Moonstone jewelry. One of her most exquisite brooches circa. 1925, was set with opal, tourmaline,sapphire, citrine, amethyst and you guessed it - Moonstone! Natural Pearls, Opals and Moonstones were the only gems considered "acceptable" to combine with primary Victorian Antique Diamond Jewelry. That is one of the reasons why many collectors like to invest in Moonstone jewelry. Moonstone was a favorite gemstone for the Promise Rings. Although Moonstone was not considered "precious" in the Victorian era, fine Moonstone Jewelry nevertheless, was considered 'primary' jewelry, because of the artistic value of the composition as a whole. Moonstone Jewelry is a great favorite, among many Antique Jewelry Investors, and if you happen to Invest in Moonstone jewelry, you will know exactly what I mean. Moonstone was named after "moonshine" because of its white shimmery appearance like the moon. Moonstone belongs to the Feldspar Group. Who was the most luminous star on the British Royal Family tree line? Many consider it was Queen Victoria - this Lady definitely wasn't loved for her snob appeal! Drawing from the literary arts, "Lest We Forget " forms the refrain of the poem "Recessional" by Rudyard Kipling, which he as Poet Lauerate composed on the occasion of Queen Victoria's Diamond Jubilee in 1897. Victoria, delighted just as much in the semi-precious stones as the precious. When everyone else was superstitious about wearing the newly discovered Opals in Australia, Queen Victoria adored them and wasn't afraid to let anybody know. Whatever Victoria adored, her loyal legions turned into fashion. Moonstone Jewelry, was at their peak in the Victorian era, around the same time when demand for colorless gems, that wouldn't overtake the diamond, were in vogue. Moonstones were often surrounded by diamonds and pearls because of their under-statedness. Not all jewelry was set with diamonds and pearls, and if you come across heart shaped cabochons, it will mostly likely be an evocative antique jewel from the 1890s. 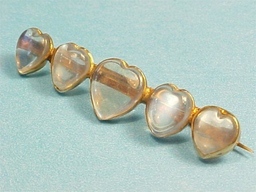 One of the most charming Victorian moonstone jewelry pins that I have come across was a row of 5 graduating puffy heart moonstone cabochons of fine quality set into a 15k gold pin. Our family has five members. My Mum loves to wear this antique moonstone brooch today (photo top of page) and the moonstones are actually a bluish color in real life. Jeweled Necklaces circa (1885) - worn below a pearl dog-collar. Colorless stones, including diamonds and pearls were usually chosen. They had replaced the bright colors of the former period. Popularly carved into hearts in the 90s they may also be found bordered with diamonds. Hatpins - ornamental hat or bonnet pins were set with moonstone with a twist of gold could be set around with diamonds and finished with a small arrow-head. When you invest in Moonstone antique jewelry, you have an appreciating, portable asset, that roars quality and that can't be compared to contemporary Moonstone jewelry produced by jewelry manufacturers of today. 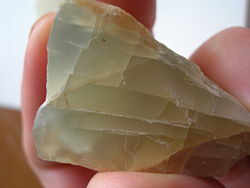 If you invest in Moonstone antique, it's more likely the stones are natural Moonstone and not dyed blue quartz. Nothing, and I really mean Nothing, will ever compare to Antique Moonstone Jewelry, evocative of the Moon, that didn't cost the Earth.